We've started a 10 week project at Warrington Art Gallery, working with people who are carers, documenting their reactions to objects in the museum through artwork and poetry. 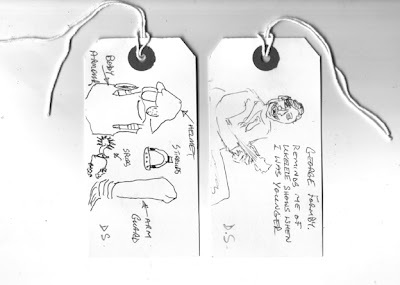 We're particularly interested in labelling the museum objects with people's stories, emotional traces. There are two bigger ideas behind the project. The first one is that carers, who sometimes have a tough life, get an opportunity to revitalise themselves - share experiences, socialise and be something other than a carer for a short while. The second hope is that their observations about the 'secret life' of the objects in the museum will make a fascinating complement to standard museum labels and information panels. The workshops were full of affectionate reminiscence as we played creative games with old toys and bric-a-brac. The first game was to identify objects by touch (they were kept in a bag) and to describe them not using names, but sense descriptions – touch, weight, smell etc. We then discussed collections and the urge to make them. The conversations were fascinating in themselves, but they also allowed something else to happen – people got a holiday from their day-to-day and instead were able to think about something else. When you're a carer you're isolated, stuck on your own, in your head. You don't socialise often. Even though the person you care for is not with you you can't switch off from them. It's lovely to be distracted here, play games. We've shared lovely memories, happy times. The last activity was to go around the galleries looking for objects or pictures that struck a chord and then write a label, describing why the object resonated. It was here that the conversation went deeper, as people connected the works in the museum with their own lives. Two of the choices touched on grief. 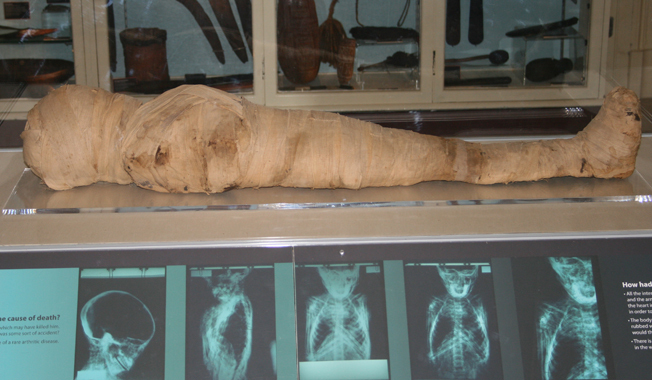 One was R's horror at seeing the mummy of a young boy here in Warrington, so far from his home in Egypt. Another was a grave doll, from ancient Peruvian civilisation. It reminded J of the experience of losing her partner – she also put some objects into his grave with him and described it very powerfully. It was astonishing to connect this very venerable relic with someone's living experience – suddenly the museum stopped feeling like a museum at all and instead became a receptacle of human lives, human hopes and feelings. But most of the human feeling expressed in the workshops was of a cheery sort, punctuated with much laughter. It seemed a good omen that one of our group discovered a painting of George Formby tucked in a corner, complete with his ukulele and cheeky-chap grin. 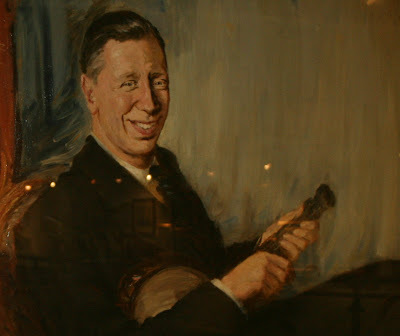 George F was a local boy and we hope to follow his example of optimism and good time-ism. But absolutely no ukuleles.